This is a delicious change from your ordinary everyday rice for a wonderfully simple risotto dish. 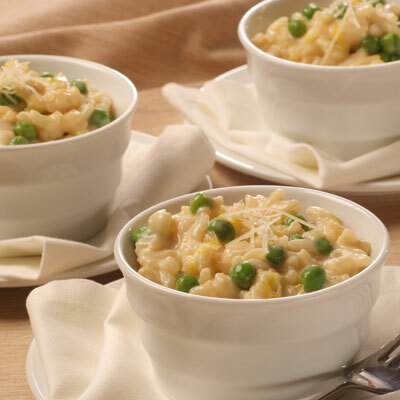 With a touch of lemon and the taste of fresh peas, this Simple Risotto with Peas and Parmesan side dish will make everyone ask for seconds. HEAT oil in medium, nonstick saucepan over medium-high heat. Add onion; cook, stirring occasionally, for about 3 minutes or until onion is tender. Stir in garlic and cook until aroma is released (do not brown). Stir in rice; cook, stirring frequently, for 1 minute. STIR in broth and evaporated milk. Reduce heat to medium. Cook, stirring frequently, for 20 to 25 minutes or until rice is tender but firm to the bite (mixture will be creamy and more stirring will be needed as it becomes thicker). Remove from heat; stir in peas and lemon zest, if desired. Season with salt and pepper to taste. Serve immediately with Parmesan cheese.